It may not be looking a lot like Christmas around here, but the temperature is sure making it feel like Christmas. Our high today is around 30, so making cookies seems like the thing to do. So, as soon as I finish typing, I’m heading for the kitchen and some cookie dough! 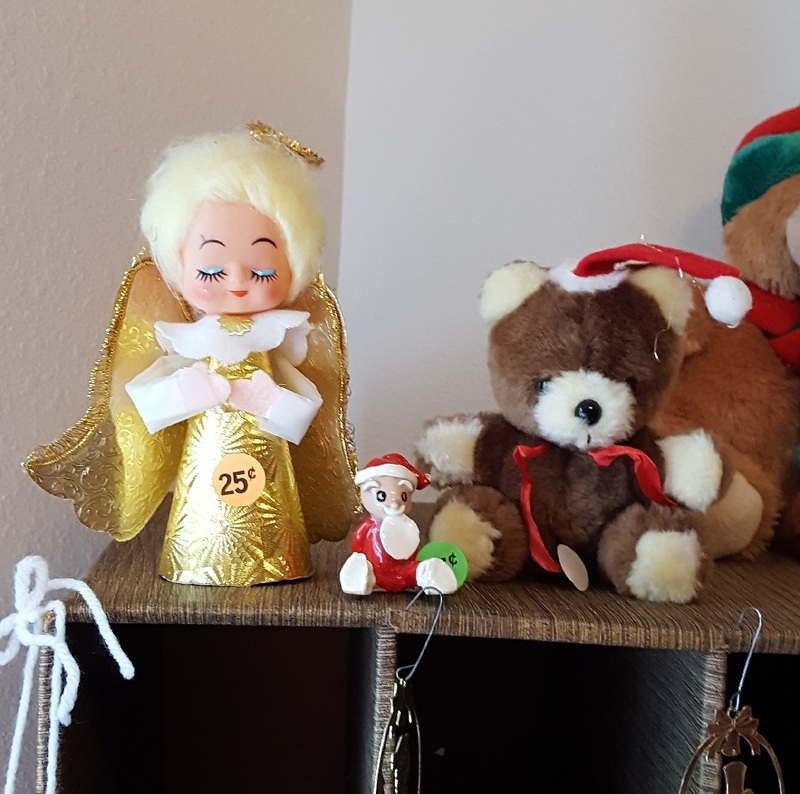 As you know, the reason for this blog is mostly love for all things vintage, so this post is dedicated to those wonderful, and maybe not so wonderful vintage Christmas things that we have come across in the last year. Sorry, not the best picture, but it is better than the one of the PINK tree that I forgot to take. Oh, I so want a pink aluminum tree, but I have yet to shell out the $500 to $800 for one on Ebay, and I haven’t tripped over one locally. Put that on the “Some Day” list I guess. 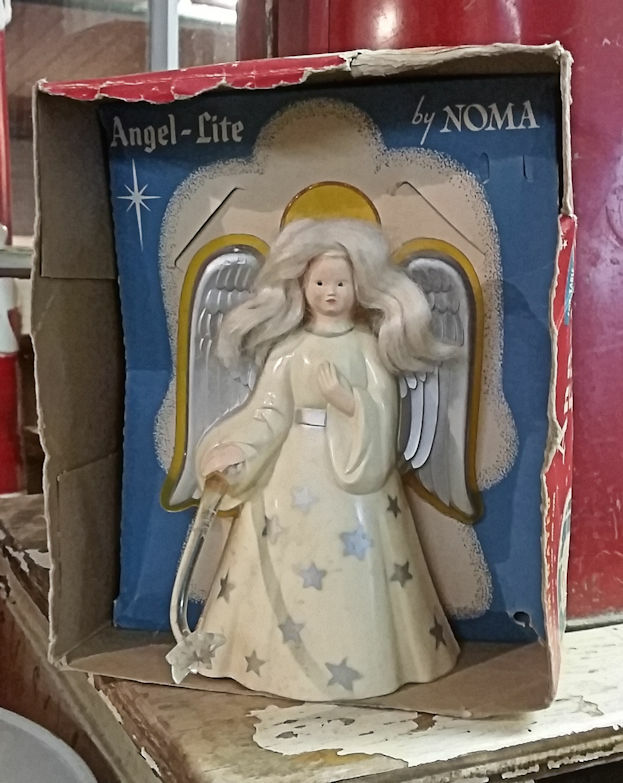 We have a soft spot for these little paper angels, but neither of us dragged this one home, though she would have been at ease on top of all that shiny silver. She may be shutting her eyes to keep out the glare, or maybe she had a glimpse of some of the ornaments towards the end of the post. 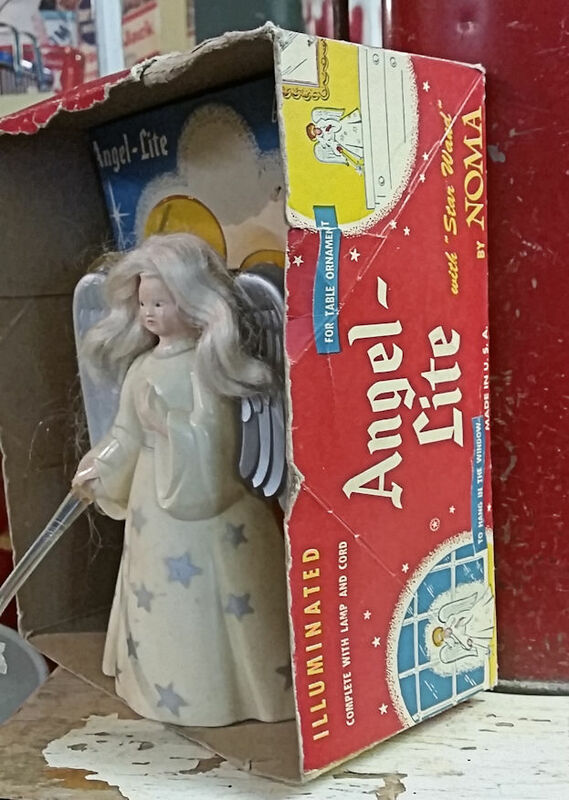 I have several pretty little paper angel ornaments that are treasures in my collection. A couple even belonged to my grandmother, so with a bit of care they can last a really long time. Just love the old graphics on the Noma boxes. I am fairly sure she would still work too, as Noma products seemed to be built to last. I am sometimes terrified of those old cords, but the lights still come on! She has a real mod ’60s vibe going on with her. Let’s call her the flower child angel. At least she is cheerful and wide awake! I don’t know what it is about these crazy little Japanese critters that we are so drawn too, but we are. 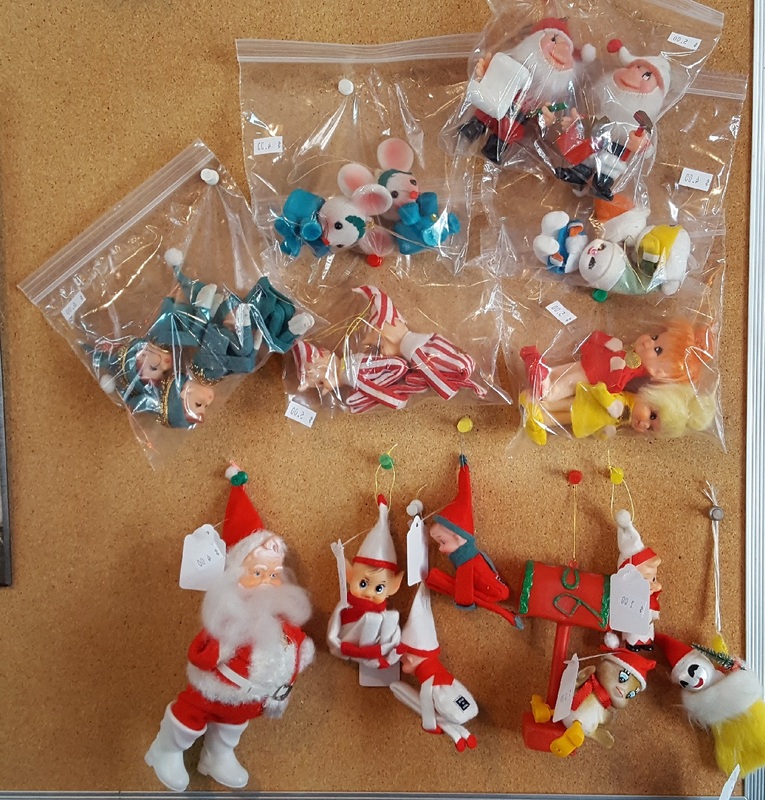 Deb is a huge pixie fan, and I can’t remember whether she picked up any of these or not. Would depend mightily on the price; as you know we are cheap, especially when it comes to this sort of thing. Although considering the numbers of them that have followed us home of the years, you wouldn’t know it. 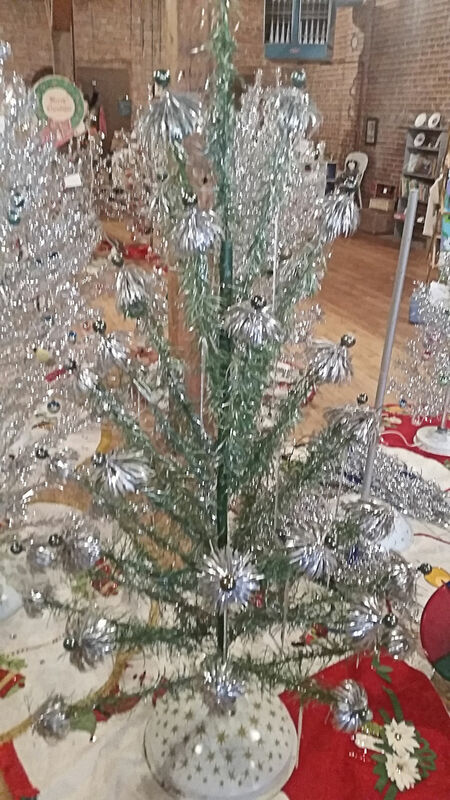 While not vintage, all those flashy sequins would be right at home on any vintage-style tree. Gotta admire a soldier who is not afraid of a little bling. All in the name of holiday spirit! While giving them credit (sort of) for what should be a charming idea, it just sort of fell flat. The one good thing about the whole shebang is that it’s a lovely shade of green that, with any luck at all, your live Christmas tree should camouflage nicely. 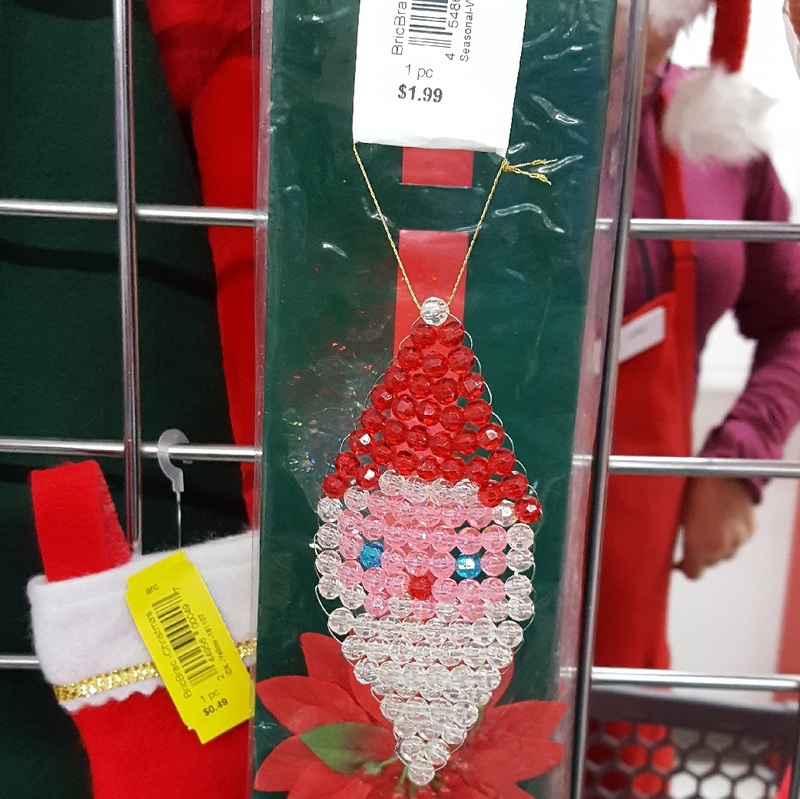 Please don’t hang it on one of those glittery silver branches. Better yet, toss that bit of seed out for a hungry bird and burn the rest of it! We are going to insist this was done by a child, so we will give them full marks for a good job. If it wasn’t, they really shouldn’t have. 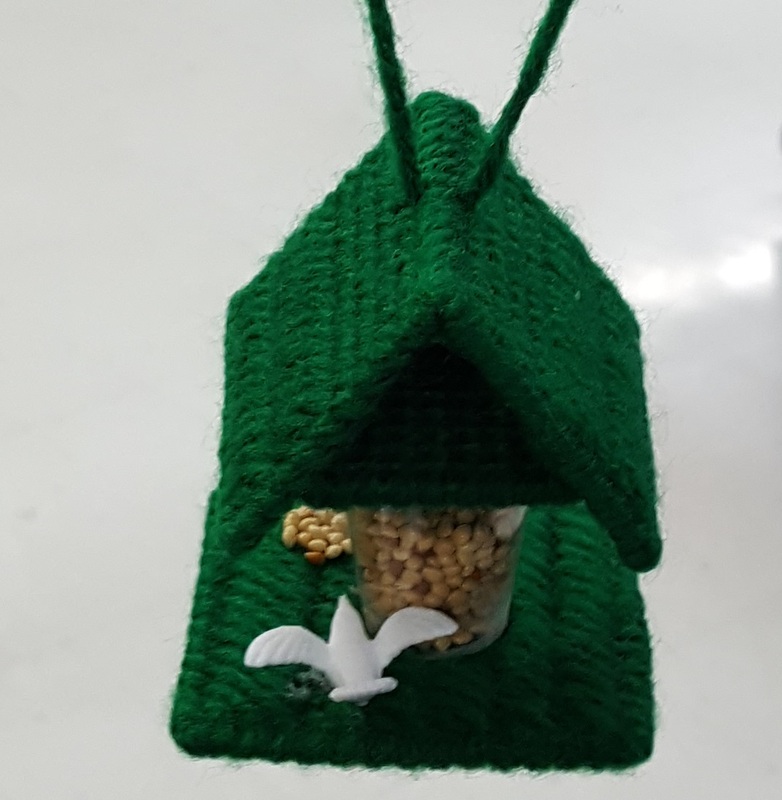 This might work with seed beads in a super tiny size, but once it gets a little bigger, it’s just not much to look at. Poor Santa. We know why he was relegated to ornament dross at ARC. I am sure that there will be more vintage things coming out of the woodwork soon. We take Christmas pix all year, so you never know what will come along. 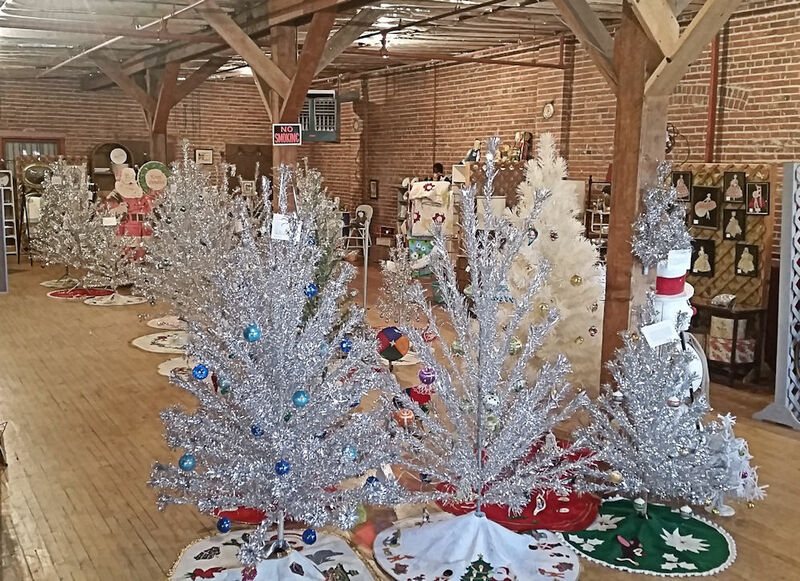 If you guys are good, I will take a picture of my poor showing with only three aluminum trees, once they are up. If anyone sees a pink one that is an orphan, you know who to call! 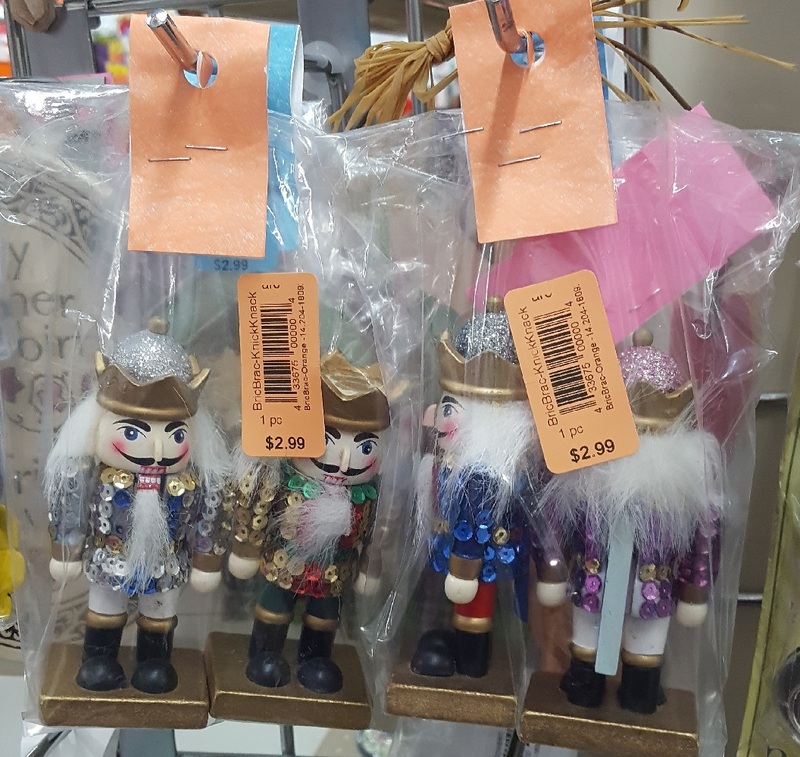 This entry was posted in Friday Finds, Holidays and tagged Angels/Cherubs, Animals, Christmas, Crafts Gone Wrong, Dolls, Estate Sale, Garage Sale, Holidays, Thrift Store. Bookmark the permalink. Ha, the ‘mangled manger’ in green is a riot. 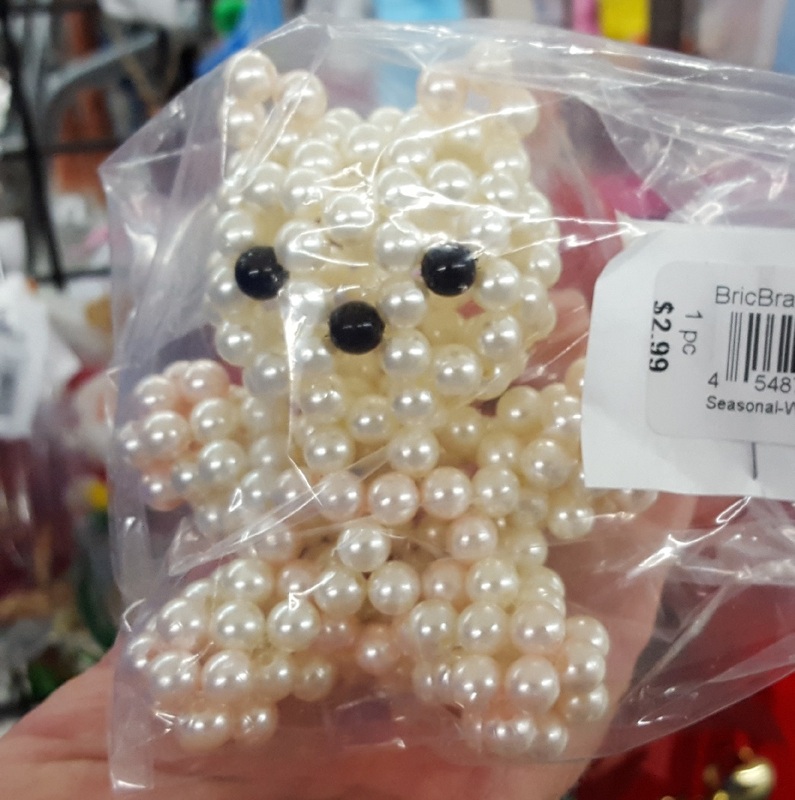 And, the pearl teddy is sorta intriguing. Yeah, we were kind of mystified why that manger was Kelly green! 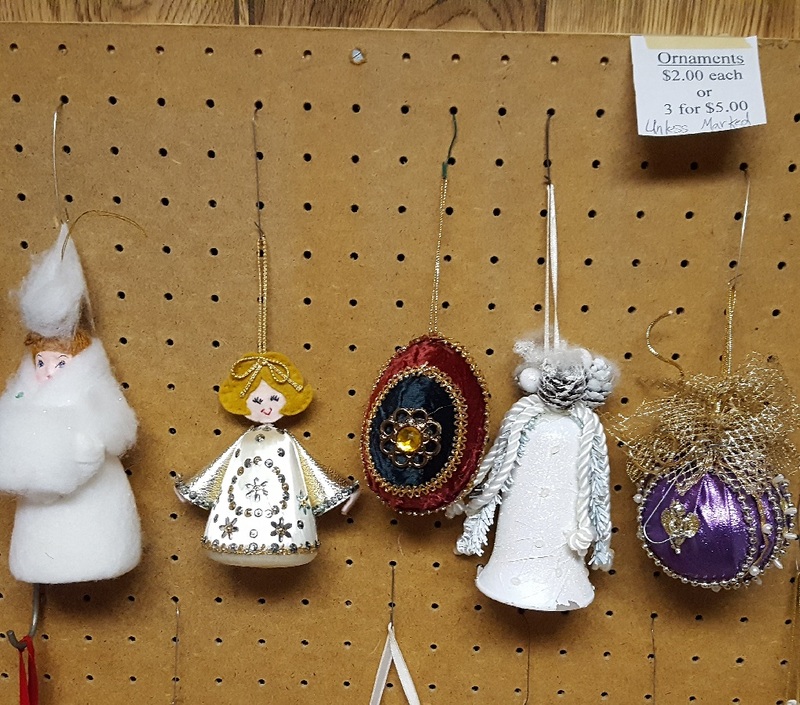 There was a lot of work in that pearl ornaments; wish it had been just a little cuter. Thanks for chiming in!